Bangalore: In an effort to boost e-commerce space, one of the leading Bangalore-based travel companies Yessaar Group has announced the launch of India's first ever barter bank for entrepreneurs. The company has also integrated e-commerce and travel together. The group is introducing an online barter bank, known as Top Barter Card, for entrepreneurs and the business network community. The Top Barter Card will allow entrepreneurs to barter their products and services within the Top Barter Card business network from their office. It is a simple and flexible barter system that converts excess of inventory, spare capacity into extra sales and helps you to stop cash flow. Top Barter Card has created a flexible, secure and fully accountable way for businesses to barter your products and services online, company said. This is one of the largest B2B networks with over 1,00,000 business members in India, who would be effectively using barter to optimise their profitability in business. It offers an innovative way of combining modern technology to help increase your sales and conserve cash through a community of like-minded businesses by barter-trading, instead of paying cash. Additionally, under the two e-commerce handles, TopTrade.in and TopTickets.in, Yessaar aims at bridging the gap between the manufacturers and wholesalers to the end customers. As a result, the portal offers the lowest and best prices for categories like electronics, laptops and other home appliances. The portal claims prices lower than its competitors Snapdeal and Flipkart. The humongous discount categories clearly surpasses the largest e-commerce players of the country. The portal, TopTrade.in is a one stop shop for all your shopping and travel needs. It brings the wholesalers and traders directly to your doorstep, therefore blending together a diversity of buyers and sellers across a plethora of categories through a user friendly interface. "Every entrepreneur, from a vegetable vendor to a real estate broker to a start up owner, can be benefited from the barter card. It is aimed at increasing the business network, decrease excess inventory, exploring new market places to buy and sell services, widen the customer base and more, " Shane Chopra, Director, Sales and Marketing, Yessaar Group said during the launch. 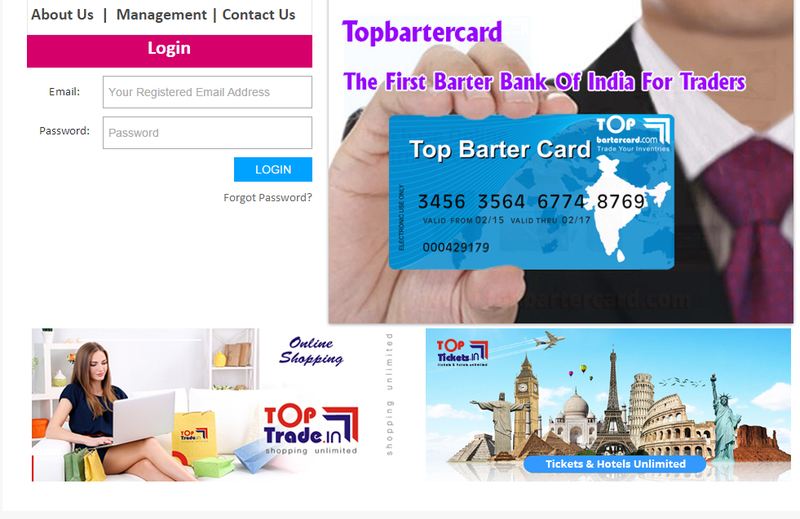 Top Bartercard is a barter exchange founded in Bangalore in 2012. Top Bartercard enables member businesses to exchange goods and services with other member businesses without using cash or cash equivalents, or having to engage in the direct two-way swap of goods and/or services. What is Top bartercard / Top bartercard Trade ? Top bartercard is a medium in which goods or services are directly exchanged for other goods and/or services without a common unit of exchange (without the use of money).A trade or Top bartercard exchange is a commercial organization that provides a trading platform and bookkeeping system for its members or clients. The member companies buy and sell products and services to each other using an internal currency known as Top bartercard or trade Rupees. Modern Top bartercard and trade has evolved considerably to become an effective method of increasing sales, conserving cash, moving inventory, and making use of excess production capacity for businesses around the world. Businesses in a Top bartercard earn trade credits (instead of cash) that are deposited into their account. They then have the ability to purchase goods and services from other members utilizing their trade credits – they are not obligated to purchase from who they sold to, and vice versa. The exchange plays an important role because they provide the record-keeping, brokering expertise and monthly statements to each member. Commercial exchanges make money by charging a commission on each transaction either all on the buy side, all on the sell side, or a combination of both. It is estimated that over 350,000 businesses in the United States are involved in Top bartercard exchange activities. There are approximately 400 commercial and corporate Top bartercard companies serving all parts of the world and the % volume is as high as 40%. In India still the percentage of Top bartercard business is around 15 to 20%. Exchange systems provide new sales and higher volumes of business, conserving cash for essential expenditures, exchange of unproductive assets for valuable products or services, reduction of unit costs, and opening new outlets for excess inventory and unused capacity. Reciprocal trade finance enables a firm to buy using its incremental cost of production. So long as incremental revenue exceeds incremental cost, it is worth it for a firm to trade using a Top bartercard exchange.